Three, two, one, BANG! At the discharge of the pistol we exploded like buckshot, adrenaline coursing through seldom used muscles, legs pumping like pistons. Terror gripped the pale blood-drained face of our passenger Kay, as we propelled the red and white-wheeled frame into a frenzied, uncontrolled sprint away from the starting gate. Her frail hands locked the frame in a death grip as the metal bed frame plummeted headlong down the narrow runway. A naked mattress mounted on a pedestal, the symbolic icon for the lofty significance of the event, marked the turning point. We dug in our heels to stop the runaway bunk before it careened into the crowd. Two of our team leaped to stretch the fitted sheet around the mattress, while I frantically struggled to stuff the required pillow into what seemed like a too small pillow case. Completing the required chores our finely tuned team shot the bed frame back toward the finish line at break-neck speed. Four pairs of legs hammered the ground, lungs gasped for air. With heaving chests we forced our last ounce of energy into a final burst of speed. Thirty-one point zero seven seconds, the announcers voice boomed. The crowd cheered. I threw up. 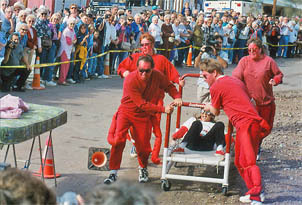 What in the world had induced me to enter the Tenth Annual Oatman Bed Races? Was I trying to prove I had not lost the vigor of my youth? Or when I looked in the mirror did I see Russell Crowe, Gladiator, mounting a challenge to the fierce competitors on the floor of the Coliseum? Oatman, Arizona, straddles Historic Route 66 in the hilly center of a triangle formed by Laughlin, NV, Kingman, AZ, and Needles, CA in the Mojave Desert. It is a strange enough place under normal conditions, but on this warm Sunday in January, the streets were filled with an inordinate number of eccentrics. The resident collection of grizzled old miners and leather-clad Harley riders mingled totally at ease with the snowbirds in their recreational vehicles from Lake Havasu and Laughlin. Several men dressed (partially) in nightgowns (one in over-sized diapers), a collection of giant red ants, scattered escaped convicts, grim-faced gun-toting desperadoes, and a bevy of buxom floozies decked out in fiery red, frilly pink, and seductive black attire strolled about town. This eclectic collection of characters had gathered for todays long-awaited spectacle. A parade kicked off the excitement of the games, proudly led by an ancient VFW color guard followed by the gladiator contestants, the volunteer fire department, and an assortment of local dignitaries and townspeople. The pageantry was replete with blaring sirens, honking horns, and gunfighters firing their six-shooters into the air while children held their ears and squealed. The expectant crowd buzzed with anticipation, cameras poised to capture every nuance of the drama about to unfold. Unlike some of the teams that had perfected their skills and honed their timing into flawless split-second precision, I had been lured by the anticipation of fame, if not fortune, only minutes before by the emergence of a last minute sponsor, eager for strong, taut, competitive athletes to bring glory to his entry. How could I resist such a challenge? The competition was fierce and the enthusiastic and sometimes partisan crowd applauded and cheered heartily for each team as they narrowly avoided disaster in the heat of competition. A few beds spun out into the dirt and nearly overturned. Only a highly trained teams bed racing experience saved the rider from being unceremoniously dumped into the dust. Even the cameraman from TV Channel 12 got into the act. Volunteering as a required bed rider he clutched his unwieldy video camera and bravely filmed the race from the inside, hugging his expensive piece of equipment with one hand while clinging white-knuckled with the other to the bed frame as they bounced erratically down the course. The coterie of dance hall girls, aptly named the Jezebels, took the last run. When the gun sounded they burst from the starting line in a slow-motion beguiling prance, hips swaying, petticoats swinging side to side, blowing kisses to the crowd as they sashayed their way to the turning point where they all stopped and looked quizzically at one another. "We don't make beds," they proclaimed and asked for men from the audience to volunteer for the chore. Naturally they had several willing gentlemen who, despite some ear tickling and neck carressing, managed to perform the required duties, though with a definite lack in concentration and coordination. They were properly rewarded with a kiss on the cheek. The Jezebels won the prize for best costumes and for audience appreciation, never mind the time it took to complete the course. The county EMTs, dressed in hospital scrubs and as athletic as they were knowledgeable about how to make a bed, emerged as the overall race winners in near record time. Oatman could easily have become one of those ephemeral western boomtowns, elevated to momentary fame by exuberant miners, only to fade into decrepit deterioration when the mines exhausted their bounty. But the few tough-it-out residents that remained have resurrected this tiny hillside town on historic route 66 into a modern day western retrospection of its rambunctious past. Several of the ramshackle miners cabins and slapdash storefronts have beenI wont say restored--but rather restrained from further deterioration. They now house souvenir, memorabilia, and rockhound shops, as well as a couple of lively saloons and greasy spoons. A roster of resuscitated old geezers and a smattering of friendly burros fill out the Old West ambiance. Give credit to the burros. Turned out into the desert by the miners who could no longer afford to feed them, they survived and propagated on the pungent creosote and prickly cacti of the rocky hillsides. Though they turned out to be as tough and self-sufficient as the miners, they also discovered that the carrots they could extract from Oatmans visitors were much tastier than bursage and burrobush. Today these effective equines roam the streets freely as goodwill ambassadors, unofficial tourist attractions, and traffic snarlers. After the excitement of the races the fun continued into the saloons and onto the streets where fiddlers fiddled, cowboys waxed poetic, and dancers swirled. The burros joined the festive mood with doleful enthusiasm, nosing into every available purse and bag for carrots and alfalfa pellets sold in many of the local shops. But for me, I refrained from the activities that continued on into the night. We highly trained gladiators need to keep rested for the next grueling physical encounter in the great coliseum of life.